House Majority Leader Steny Hoyer (D., Md.) subtly hit Rep. Ilhan Omar's (D., Minn.) suggestion that supporters of Israel have dual loyalty, telling attendees at AIPAC's annual policy conference on Sunday that he stands with Israel "proudly and unapologetically." "When someone accuses American supporters of Israel of dual loyalty, I say: Accuse me," Hoyer continued. 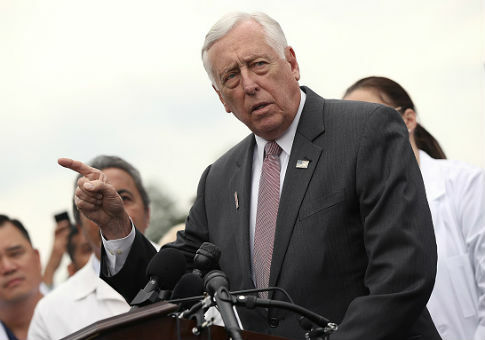 "I am part of a large, bipartisan coalition in Congress supporting Israel, an overwhelming majority in the Congress of the United States," Hoyer added, according to the Washington Examiner. Last month, Omar said she wanted "to talk about the political influence in this country that says it is okay for people to push for allegiance to a foreign country," and doubled-down on her remarks in tweets directed at fellow Democratic congresswoman Nita Lowey (N.Y.). House Democratic leaders scrambled to write and pass a resolution condemning various forms of hatred in the wake of her remarks. Omar had previously drawn scrutiny for separate remarks, and she apologized in early February for anti-Semitic tweets, in which she alleged AIPAC pays politicians to be pro-Israel. She also acknowledged a tweet in which she accused Israel of hypnotizing the world and performing evil acts was "unfortunate." Last week, the liberal group MoveOn called on 2020 Democrats to boycott AIPAC's policy conference, accusing the organization of "undermining Palestinian self-determination, and inviting figures actively involved in human rights violations to its stage." Several Democratic presidential candidates announced they would not attend AIPAC, including Sen. Elizabeth Warren (D., Mass. ), Sen. Kamala Harris (D., Calif.), and Sen. Bernie Sanders (I., Vt.). Omar appeared to take credit for Democrats skipping AIPAC, sharing a tweet from Rep. Alexandria Ocasio-Cortez's (D., NY) chief of staff Saikat Chakrabarti that credited Omar for the rift between AIPAC and progressive Democrats. Ocasio-Cortez herself sent an email to supporters claiming the organization was targeting her, Omar, and Rep. Rashida Tlaib (D., Mich.), the Examiner reported. This entry was posted in Politics and tagged Alexandria Ocasio-Cortez, Anti-Semitism, Ilhan Omar, Rashida Tlaib, Steny Hoyer. Bookmark the permalink.